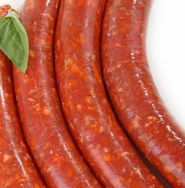 "Morocco, one of the earliest homes of the Merguez-type sausage, has its own unique way of making these spicy sausages." "Part Casablanca and part Sahara, this sausage is refined yet powerful. With spicy hot highs and tasty herb lows, this sausage has enough taste to spice up your life, not just your meal!"